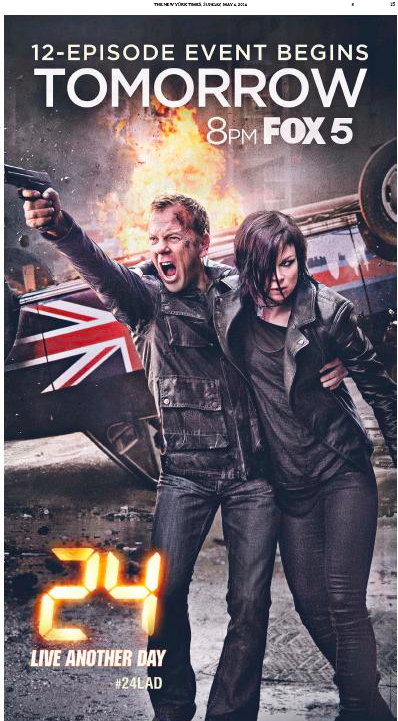 Version 6.0 of Fox’s fabulously successful series 24 premiered on Monday, and you can count on uber-sponsor Chrysler Motors to rev its ad engine in any number of ways throughout the season. From MediaPost . . . This entry was posted in Uncategorized and tagged #24LAD, 24: Live Another Day, Air and Space Museum, Andy Love, Chrysler 200, Fox, Intrepid, Jack Bauer, Kiefer Sutherland, MediaPost, Sneak ADtack. Bookmark the permalink. Fascists need sporty affordable luxury, too.